The large deep water port of Brest was large enough to receive battle ships like the Tirpitz. Also a U-boat pen was constructed inside the harbour. 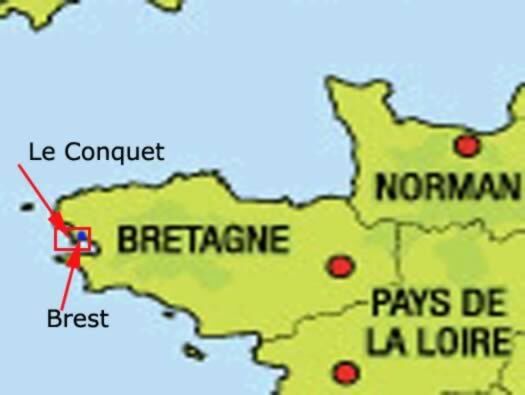 That meant that the whole area around the entrance to the Rade de Brest had to be defended. After the attack on the lock gate at St Nazaire the defence was again increased. 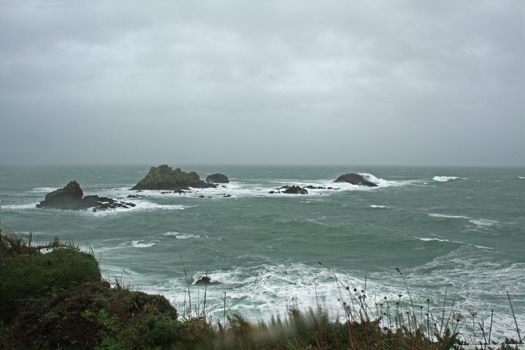 Pointe St Mathieu is the site of the Abbaye Saint-Mathieu de Fine-Terre and Wn Re137. 1 x Fu.MG Seetakt Gema ('Calais 7'). 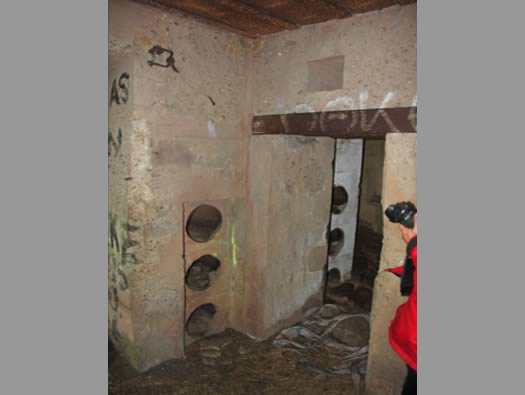 2 x Sk/Searchlight garage bunkers. 1 x M182 searchlight bunker. We parked in the car park at the Abbey and walked the Abbey & the Vauban fort and a small battery of French guns red arrows. 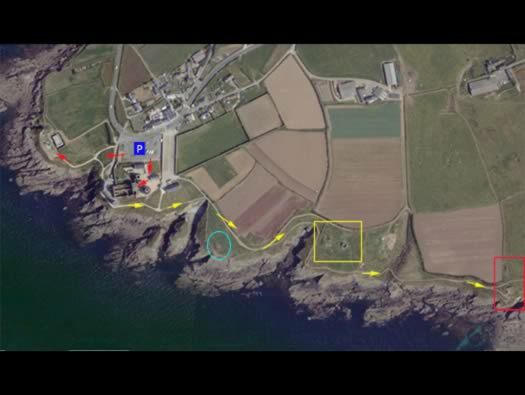 Then we walked yellow arrows along the coast path. 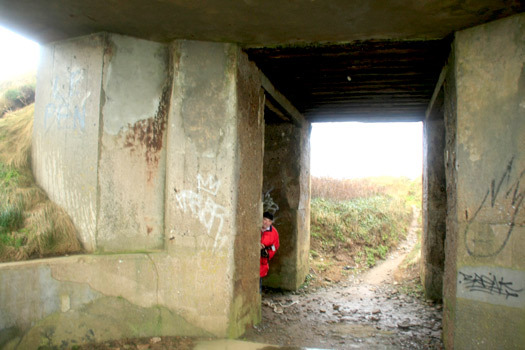 At the blue circle we found a French emplacement, yellow square a bunker & an ancient lookout and the red square a searchlight and its garage bunker at Wn Re307. 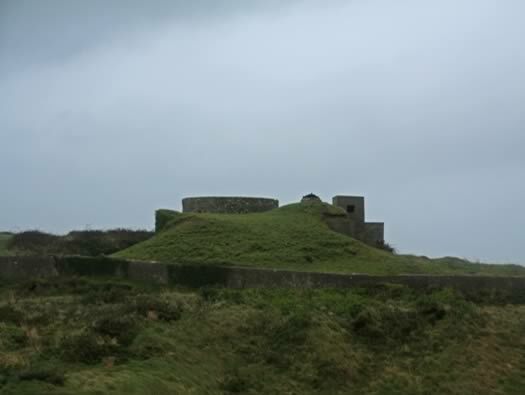 Re137, Pointe St Mathieu. Lighthouse and Abbey. 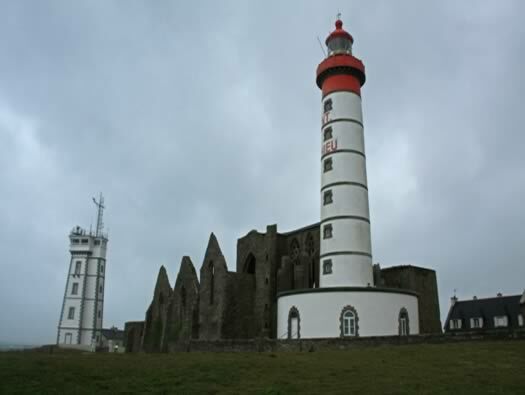 The 56meter lighthouse built in 1835 and the Abbey church was built from 1157 to 1208. 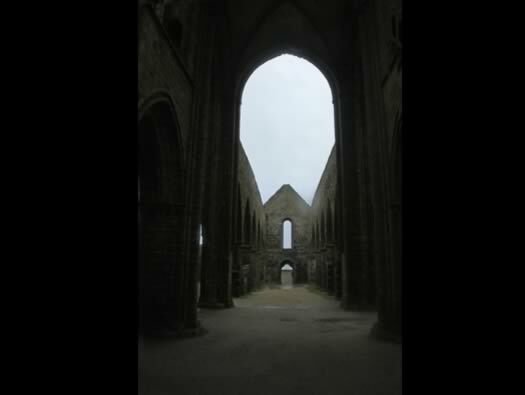 (It was burnt down by the English in 1558). Those English get around. 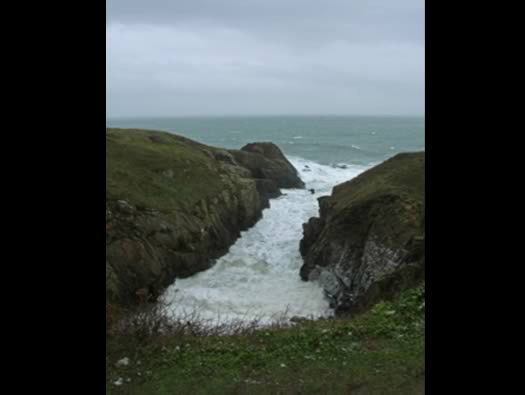 Re137, Pointe St Mathieu. . The arms of Du Chastel. Re137, Pointe St Mathieu. 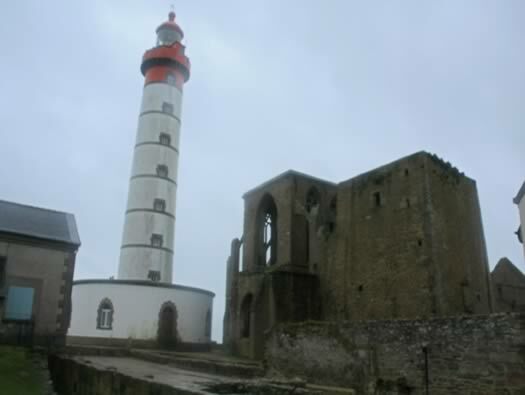 Pointe St Mathieu Lighthouse & Semaphore. 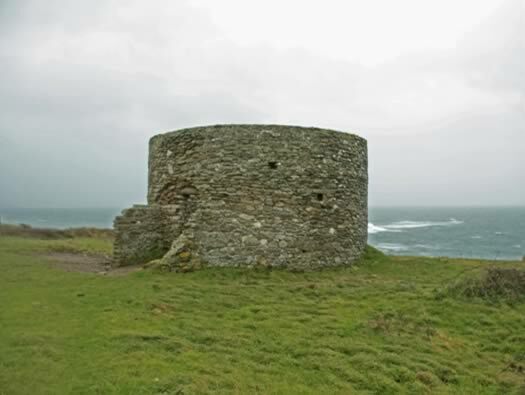 The semaphore (far tower) was built in 1905 to watch the entrance to Brest and may have had the Seetakt radar placed on the top. 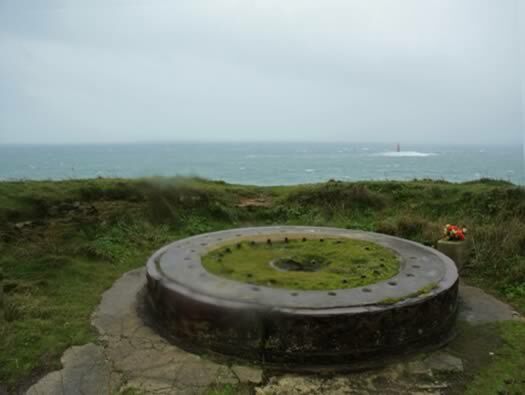 So far I cannot find any information about its whereabouts..
Re137, Pointe St Mathieu. French guns. This type of gun was used all around the coast of France and we often find the hold fast fittings at many coastal places. 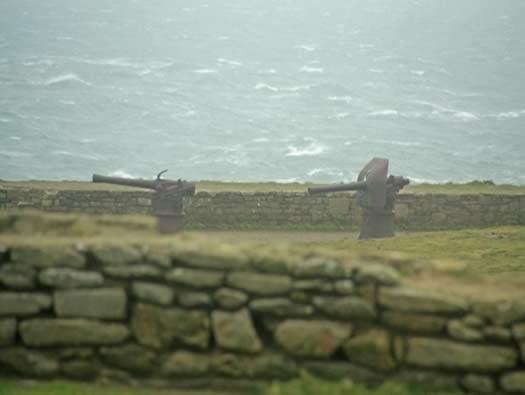 9.5cm guns canon de cote de 95 M 93. Re137, Pointe St Mathieu. 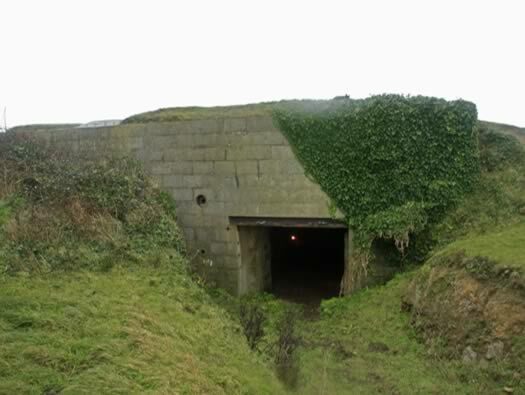 Second French batterie. Now following the yellow arrows. 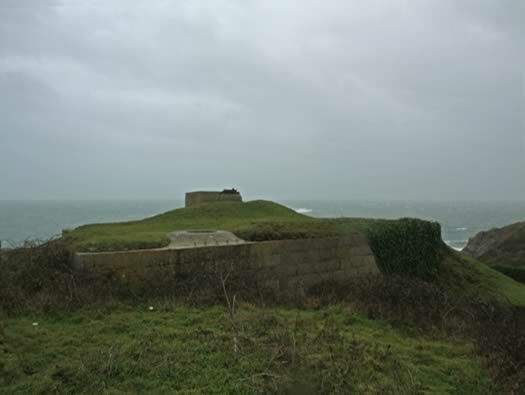 Blue circle is the site of this French batterie. After a brisk walk we came upon this gun hold fast and as there are no other works around here we presumed it to be a one gun battery position of WW1 era? 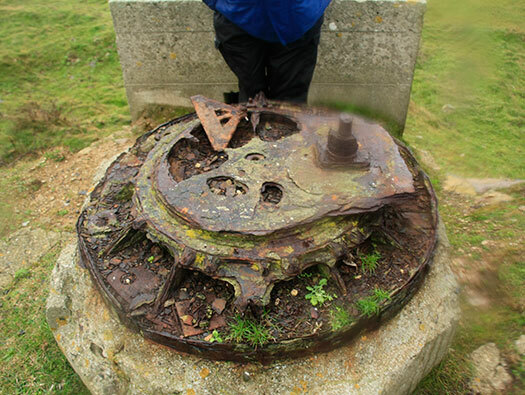 A French 13cm gun that was common around heavy batteries and may have been here? The sort of gun it may have been being used by the Germans. 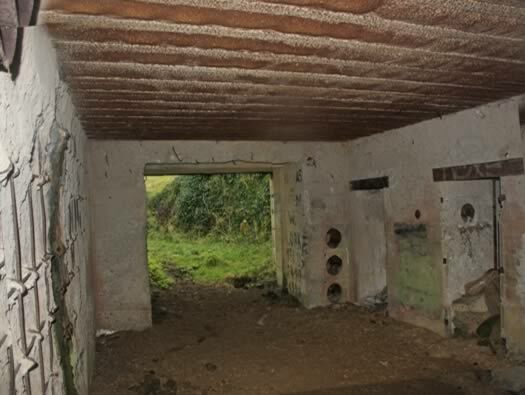 Re137, Pointe St Mathieu. 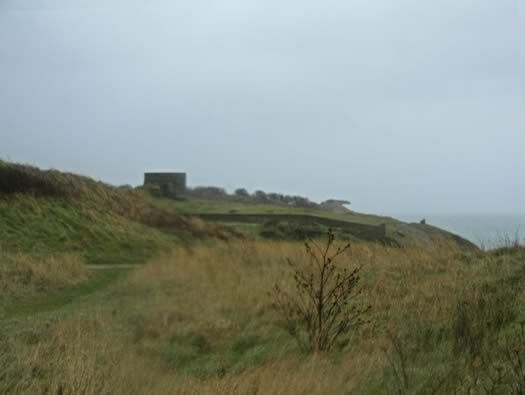 Bunker, lookout & searchlight. We did not find any radars. Continuing along the coast path. yellow square on map. It was very cold and wet. Even the Cauliflowers are growing at a 45deg angle to the wind. SK/V256 (energy bunker for the radar) this could be the power generating bunker for a radar. A plan of the bunker at StP Kerlohic an SK or a (V256) for radar Fu.M.O.51 Mammut Gustav. This is a Frieburg 11 not that dissimilar to a Fu.M.O.51 Mammut - Gustav. Re137, Pointe St Mathieu. 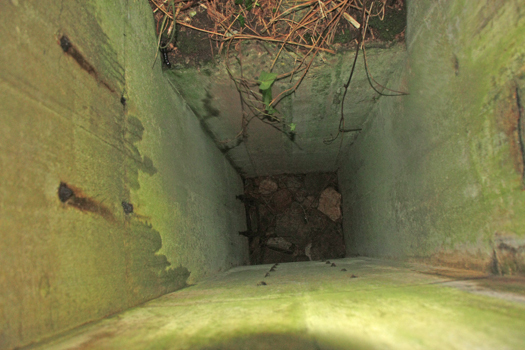 Observation escape/hatch or it may be the base of a FuMO 51 radar. Tank or ships type hatch? well that is what we thought but it looks like it is the base of a radar. Grill or air vent chimney. Behind the bunker is a French 18/19th cent. guard lookout? Re137, Pointe St Mathieu. Searchlight garage bunker, viewed from the Sea. V 256 (energy bunker for the radar) this could be the power generating bunker for a radar. 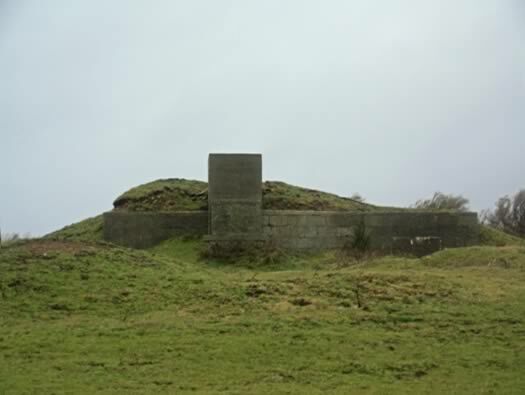 V 256 (energy bunker for the radar) made from Formstein (breeze block shuttering, filled with concrete). Re137, Pointe St Mathieu. Garage. 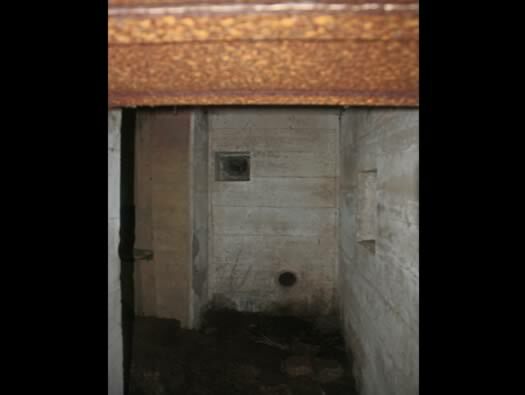 Three doors to the left, first for access to the foot entrance, second to the crew room and third the fuel store room. 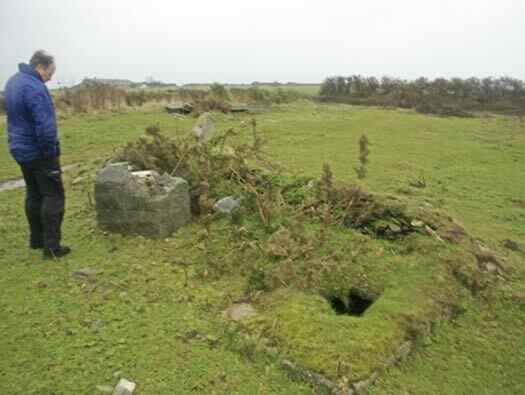 The square hole in the end wall is the breather chimney and escape tunnel. 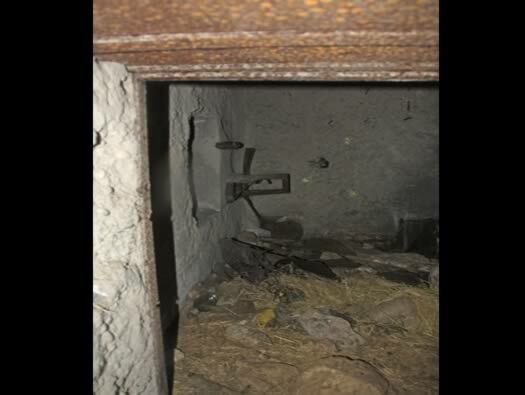 A generator may have sat in front of the chimney/escape mounted on the floor. Generator of the type that may have been used here. 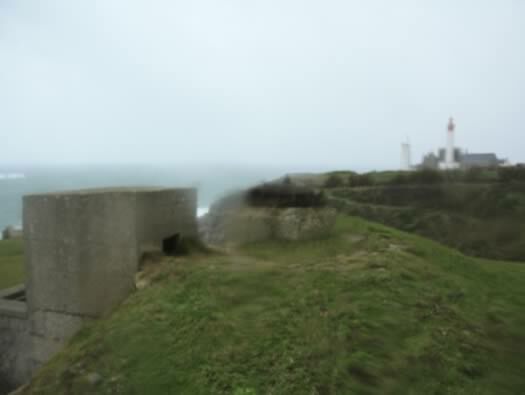 Re137, Pointe St Mathieu. Note the air vents. Three large air pipes and a single door, a 19P7 type door was fitted here. 19p7 door would have fitted here. A plan of an SK search light garage bunker. Re137, Pointe St Mathieu. Passage way out. Way out with aerial slots on both sides of the door & also the camouflage still to be seen painted on the wall. Re137, Pointe St Mathieu. Crew room. The metal fittings of the anti-gas filter still on the wall next to the close combat window. Close combat window. Left : close combat window & air filter for anti-gas filtration. 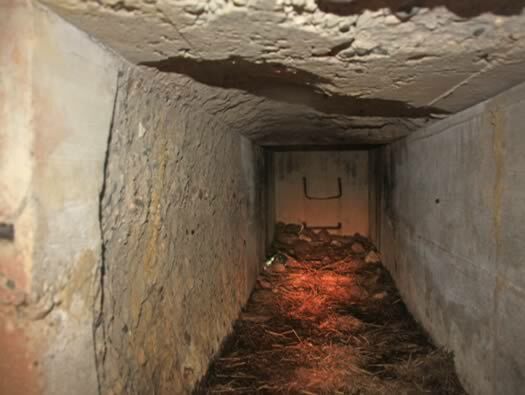 Right : inside of the close combat embrasure. This is the rest of the crew room. Plan of how the generator may have been set up in this room. Cupola escape & air vent/chimney. 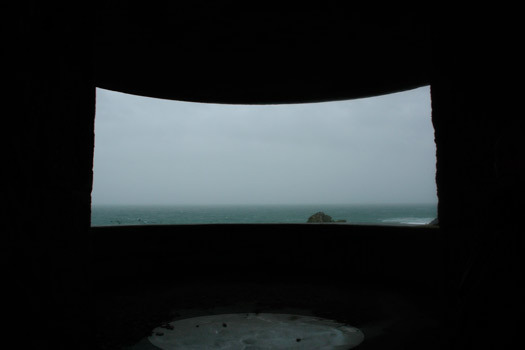 Re137, Pointe St Mathieu. Garage looking out. Looking at the garage with the door to the crew room & foot entrance. The vent in the door of the crew room is an equalizer vent. 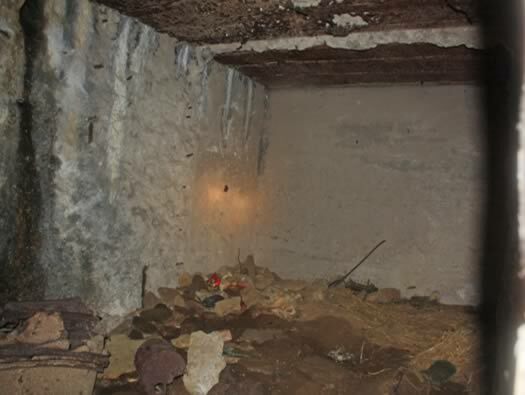 Damage to the walls may have been caused by an internal explosion after it was captured. 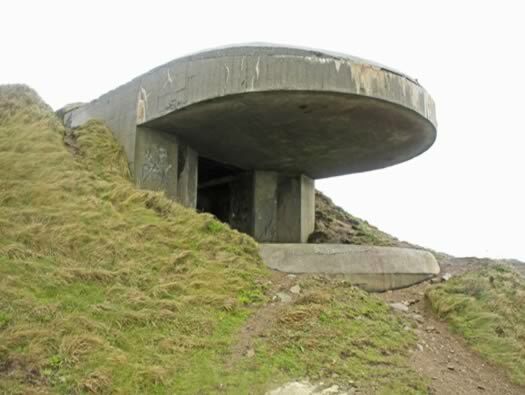 V 256 (energy bunker for the radar). Tobruk, note the hooks to hold a camouflage net. Re137, Pointe St Mathieu. 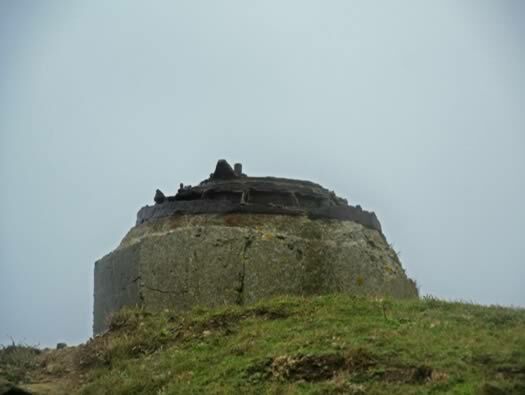 Early French lookout or a Freya radar. Openings in the wall use lintels made of concrete. Re137, Pointe St Mathieu. 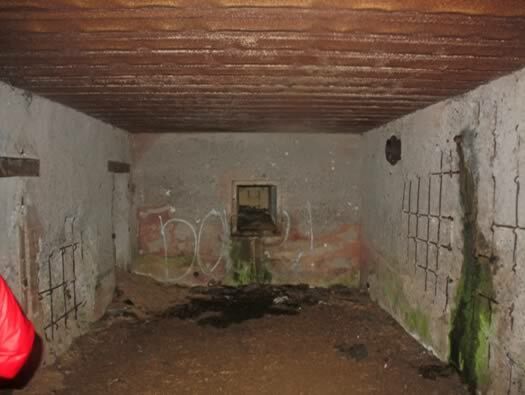 Field bunker. 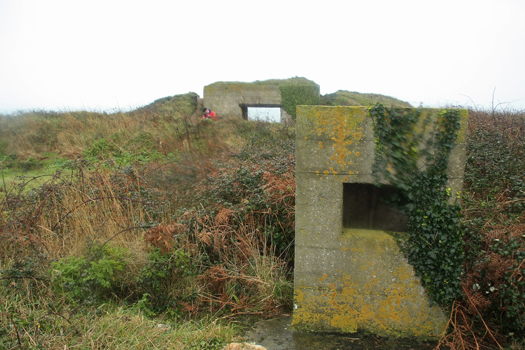 Walking the coast path this is the first fortification of Re305 a field type bunker. There is supposed to be a V256 and I have no idea what one looks like yet? 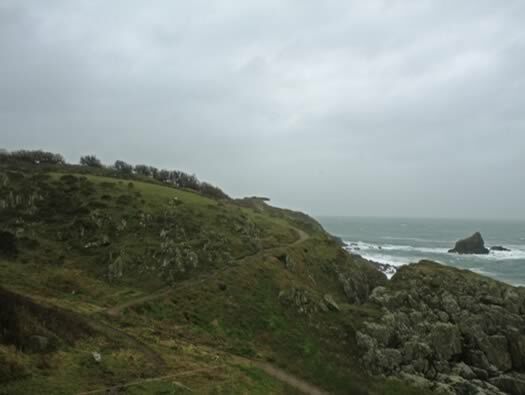 In the distance is an M182 searchlight emplacement looking out over the cliffs, These searchlights, three of them in this area would have been working with the local batteries of 'Holtzendorf ' and the large gun battery 'Graff Von Spee'. We are now coming up to the red square. Emplacement for a 150cm Searchlight. Left & Right are plans of the M182 searchlight emplacement. View through the emplacement from the back. Re137, Pointe St Mathieu. Searchlight emplacement & garage. 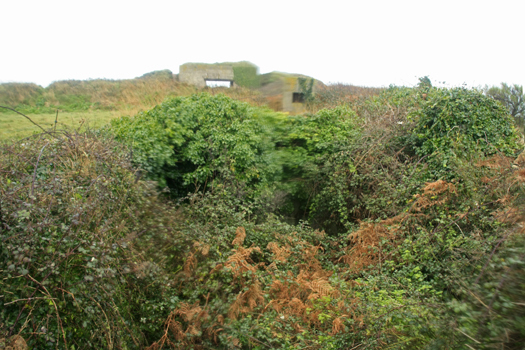 In the undergrowth is an Sk searchlight garage we could not get down there to look inside. Re137, Pointe St Mathieu. The Air vent/escape. 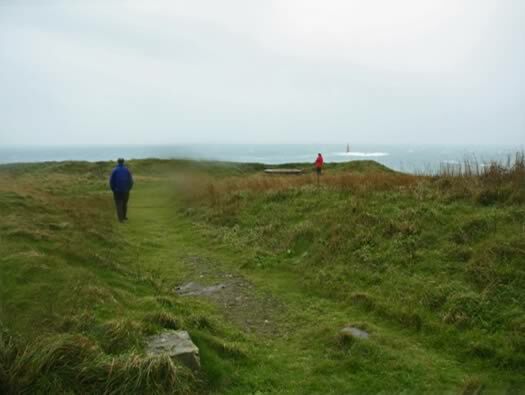 In the distance is an M182 searchlight emplacement looking out over the cliffs, These searchlights, three of them in this area would have been working with the local batteries of Holtzendorf and the large gun battery Graff Von Spee. 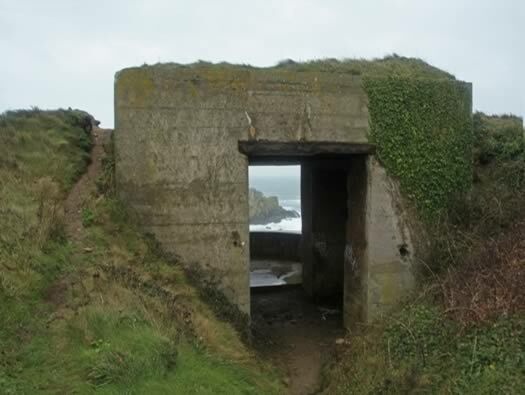 Re137, Pointe St Mathieu. Looking down the air vent/escape. Note the steel ladder rungs have all been cut off. The next landfall is the Americas.